Studio class which teaches children about artists and art practices while working in a wide range of media and techniques. All of our classes are only $50/month and are held from 4:30-6:00pm. There is a one-time nonrefundable supply fee of $50 that is due at the first class meeting. 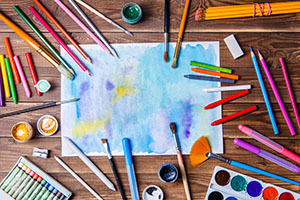 Monthly tuition can be submitted as cash or a check made payable to the Monthaven Arts & Cultural Center; supply fees can be submitted as cash or a check made payable to the teacher of your child’s class. Classes start the first week of September (excluding Labor Day, Monday September 4th) and continue through May 2018, following the Sumner County School calendar. NOTE: The April 19th class has been changed to Monday, April 16th.